Parunuweap is the canyon of the East Fork of the Virgin River, about two thirds of the size of the famous Zion Canyon of the West Fork, but unlike the often crowded Narrows receives virtually no visitors, partly as the lower half, within Zion National Park, has been closed for many years by the NPS to protect natural habitats and act as a study area. Luckily, the best part is just outside the park, as here for several miles the river flows through a beautiful, narrow, thousand foot deep gorge, and although quite difficult to reach, provides easy walking once inside as there are no major obstacles, just a few deepish pools, patches of quicksand and small waterfalls. Parunuweap also has a number of slot canyon tributaries though some are far from any trailhead and would need at least one overnight stay to explore, as would a trip through the full length of the canyon, though a fair amount can be seen in one long day. The name Parunuweap is of Pauite origin, meaning 'roaring water'. 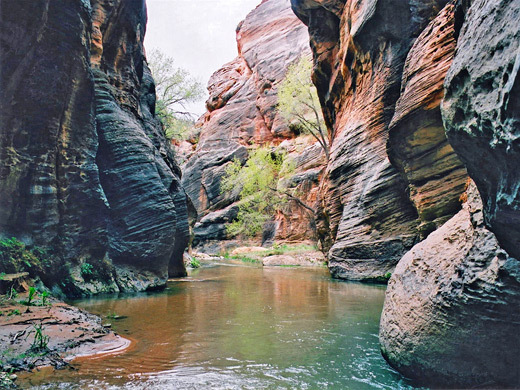 The larger West Fork Canyon was once known by a similar term, Mukuntuweap, and indeed Zion National Park began life as Mukuntuweap National Monument, before being renamed in 1918. The source of the East Fork of the Virgin River is along the west side of the Paunsaugunt Plateau southwest of Bryce Canyon National Park; it flows along the wide, wooded Long Valley next to UT 89 to Mount Carmel Junction then turns west, where it begins to cut into the White Cliffs of Navajo sandstone, forming 25 mile long Parunuweap Canyon, and then meets the West Fork a little south of Springdale. Closure of the lower canyon rules out any entry from the west, and there is no easy approach to the south, where a large roadless area of steep cliffs, canyons and mesas extends many miles into Arizona, but access is possible from other directions. 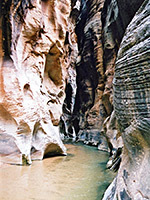 One option is to walk down the river starting from somewhere near the end of a track that follows it for a couple of miles south of Mount Carmel Junction, but the upper reaches are shallow and not too interesting, and it would take all day to reach the start of the deep, narrow section, so instead, the usual access is along one of several routes from the north, either cross-country or along side canyons, that begin from UT 9. 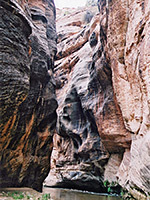 The easiest of these, and the one described here, starts two miles inside the national park boundary close to Checkerboard Mesa (from the second small lay-by west of the main parking area for the mesa, on the north side of the road), crosses open slickrock landscape to the canyon rim then descends very steeply to the river. Other possibilities are walking along Meadow Creek from where it crosses UT 9 at mile 49, the track/route down Mineral Gulch, or an approach via Poverty Wash, another great tributary slot canyon, also reached by the Mineral Gulch road. The best parts of the canyon are on BLM land so no permit is required, though if entering via the Checkerboard Mesa route described below then the $25 Zion National Park entry fee is due. 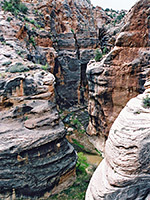 14 views of Parunuweap Canyon. TopoQuest topographic map of Parunuweap Canyon. 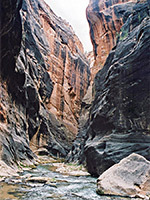 The trailhead and the first part of the route is also used to reach the Misery slot canyon. Parunuweap is still not often visited, but has received enough traffic in recent years for a well worn path to develop, initially up a small dune opposite the parking area then into an overgrown, sheer sided ravine between Checkerboard Mesa and the adjacent dome to the west. 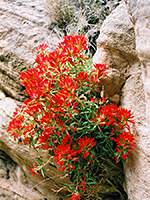 The trail is mostly along the stony streambed of a drainage, sometimes rising up sand banks to pass boulders and small dryfalls, then after about 1 mile climbs steeply up an earthen ridge near the back end of the Mesa, the top of which gives wide views over the slopes above Parunuweap Canyon and wooded plains towards the southwest in Arizona, where the ground falls away at the edge of the Colorado Plateau. The path down the far side of the ridge is less steep, and soon bends east, close to the far side of Checkerboard Mesa - also smooth and rounded like the front, but with a less regular checked pattern. Ahead, the terrain is quite open, a mixture of sand dunes, red and white slickrock, patches of trees and bushes, and small canyons that deepen to the south. The path is still reasonably well defined and marked by cairns in places; it crosses up and over two significant drainages then veers south and a little east, along the near side of a prominent white slickrock ridge, which rises southwards to a summit at 5,534 feet, then begins a long gradual descent towards the East Fork canyon. The route trends back slightly west and eventually ends on a narrow ridge just before a small rocky summit right above the river. From here the path turns right and drops 500 feet very steeply to the canyon floor - some parts are over loose rocks, and a little climbing is needed. The total elevation loss from Checkerboard Mesa to the river is 1,500 feet, and the return journey, much of which is up exposed, south-facing slopes, can be very tiring on a hot day. So, it takes a while to reach the canyon - between 1.5 and 2.5 hours, and quite a long time to describe the route but once at river level progress is much simpler. The trail enters in the middle of the deepest, narrowest part of Parunuweap, near the end of a section known as The Barracks, and a couple more hours is enough to see the best parts, mostly upstream, since downstream the hike is stopped after about half a mile by a waterfall (Labyrinth Falls), though the Zion National Park boundary is nearby so continuing past the falls is not permitted, and the canyon is soon very much wider and less interesting. The water in this deep, dark ravine is cool and fast flowing, generally 6 inches to 1 foot deep during dry spells but with always a few large pools that can usually be bypassed. Walking is about half in the river and half on banks of sand or pebbles, and sometimes over boulders and rapids. Up river from the entrance point, and around a wide bend, the lower end of Misery Canyon comes into view - this is a very narrow slot that emerges from a pretty grotto with pools and small waterfalls, then becomes very dark and enclosed. After here, back in the main canyon, narrows alternate with wider parts, all filled with cascades of various sizes, one of which has quite a deep channel that may require climbing up a log beside a big boulder to continue, assuming the log is not washed away by the next flash flood. 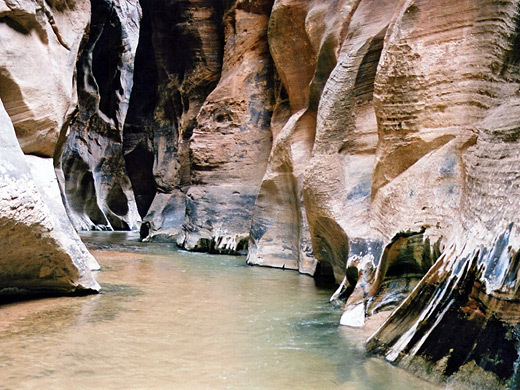 Floods are common in this canyon and can cause unpredictable changes. After 2 miles or so the canyon is just a little wider and not as deep, and has more trees and bushes growing at the edges, but is no less beautiful.